Ascending Butterfly: Back to School with Play-Doh Sesame Street Shape & Spin Elmo Playset Giveaway! Back to School with Play-Doh Sesame Street Shape & Spin Elmo Playset Giveaway! This giveaway is now CLOSED. Thanks so much to our wonderful sponsor PlayDoh! We look forward to working with you again! The winner is Nicole G. Congratulations Nicole! Remember: There are great giveaways active on the upper right hand side of the page! Our Back To School themed Giveaways continue, this time with something for the younger set! A little known fact about me is that I am spot on doing two children's themed impressions, Elmo and Pillsbury Dough Boy! I adore Elmo and The Pillsbury Doughboy and have somehow amassed quite a collection of themed merch (I'm not all butterflies you know!) I will admit I have a Tickle Me Elmo that's mine, all mine! Perhaps I've missed my calling as a voice over artist? I wanted to make sure our Back to School giveaways included a little something for everyone so we started with Staples and we are going to switch gears to younger children with the Sesame Street Shape & Spin Elmo Playset. While it's recommended for Ages 3 and Up, if you are anything like me you are going to want to play with it, I mean ahem, test it out too! This set combines two favorites of mine, Play-Doh and Elmo! I met the Play-Doh reps during the BlogHer-2010 Conference in New York City, at their booth at the Expo Hall they were giving out one of the most unique products I received during the conference, PlayDoh Cologne! Boy does that smell take me back, and so does this Playset. Play-Doh was one of my favorite childhood memories, and playing with it now with my nieces and nephews always makes me smile. They enjoy it as much as I do! Play-Doh is distributed by Hasbro, and I truly appreciate their packaging offers full disclosure on what is important to know about Toy Safety and Box Content. This playset comes with playmat, 3 stampers, instructions, and 3 three-ounce cans of Play-Doh Brand Modeling Compound. On the box there is a clearly marked NOTICE: Parents: contains Wheat. Nontoxic. If your child has a Wheat Allergy, this would not be an appropriate toy! This toy also requires 2 "AAA" batteries, which thoughtfully, is included in the box! 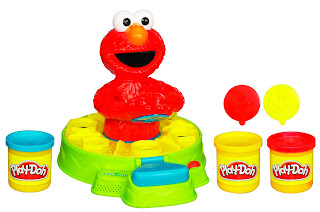 Play-Doh Sesame Street Shape & Spin Elmo Playset has two fun play modes. In mode 1, Elmo helps your child identify shapes and then counts them as your child makes them. In mode 2, Elmo prompts your child to make various shapes. Together, they'll have lots of fun creating PLAY-DOH triangles, circles and more. Because I have quite a few kiddos in my life in this age group, I opted to make this one, one of the 'play here at Auntie's toys' those are the ones in my arsenal to keep visiting little ones entertained. I have stuff for pretty much every age group, but this one proved quite popular when I had my two little nephews over during Labor Day Weekend! This is also a great toy for a pre-schooler to have! It's a fun way for kids to learn shapes, counting and fine motor skills! If you have any Pre-K aged little ones at home, this is a fun way to start prepping them, it will keep them entertained, and help you keep them away from 'the tube'. Ƹ̵̡Ӝ̵̨̄Ʒ - WIN IT! - Thanks to our friends at Hasbro one Ascending Butterfly will win a Play-Doh Sesame Street Shape & Spin Elmo Playset for their little one! Don't you just ♥ Hasbro? I know I do! Ƹ̵̡Ӝ̵̨̄Ʒ -How to Win: (1) You must be a PUBLIC follower of Ascending Butterfly to be eligible for this and all giveaways. Indicate in your entry that you follow (if your 'comment name/user id' differs from your profile id, please let me know what name you follow under) and (2) Mandatory Entry (this must be done for all others to count): Visit the Hasbro Shop and post the URL Link (NOT THE NAME) of another toy you'd love for little one. (3) You must also leave your email address somewhere in your comment. (You can format it this way for security, example: ascendingbutterfly AT mail host DOT com). (If your email is clearly visible in your profile, you can just say so, that's OK!) Please follow the easy 1, 2, 3 steps to winning (or in this case, the A,B,C’s of winning!) This giveaway is open to USA residents who are 18 years of age or older. I'm a public GFC follower. My email address is available in my blogger profile. Thanks for the shot at winning. I follow on gfc and would love to have this. I am a PUBLIC follower of Ascending Butterfly. I like the PLAYSKOOL EXPLORE ‘N GROW PUSH ‘N STACK GEARS. I "like" your FB page - Monica O.
and already subscribe to the blog emails. . .
already follow them on Facebook. . .
My son would like: http://www.hasbro.com/shop/details.cfm?guid=92BF4DA1-6D40-1014-8BF0-9EFBF894F9D4&product_id=17127&src=endeca. Thanks for the chance. Liz would like the PLAYSKOOL BUSY LIL GARDEN BENCH. http://www.hasbro.com/mylittlepony/en_US/shop/details.cfm?guid=B78FBC5D-19B9-F369-10F8-6A2A169830FB&product_id=27200&src=endeca I would get this for my neice. kekagel(at)yahoo(dot)com. I like the little garden busy bench. yup... that will be right up her alley! I'm not sure if my mandatory entry went through, if so please delete this one. my son would love that..
My nephew would love the TONKA CHUCK & FRIENDS RUMBLIN' CHUCK Vehicle.